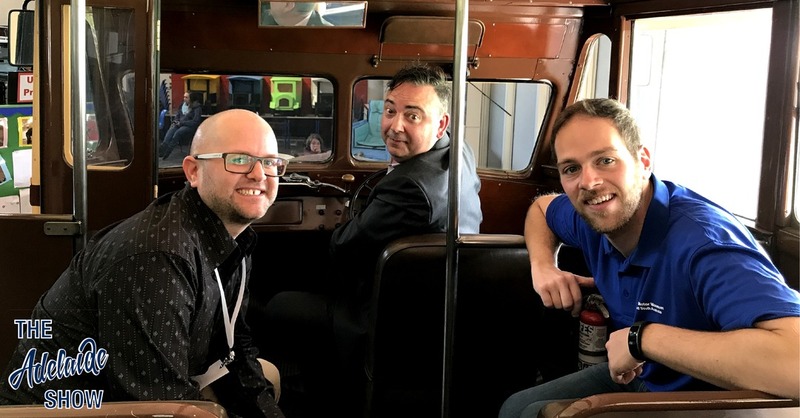 This week, we give you the Bay To Birdwood experience, from the front seat of a 1978 Mazda 121 and then from within an old MTT bus with the National Motor Museum’s senior curator, Mick Bolognese, who last joined us in episode 196, and finally on the grounds of the National Motor Museum with Michelle Toft and Paul Clark. This week, the SA Drink Of The Week is from Kersbrook Hill Wines. Michael will try to stump us in IS IT NEWS on the topic of Holdens. In 100 Weeks Ago we hear from Neil Ward the publicist. In stories without notice, Steve sits in the Mazda 121 with National Motor Museum Director, Paul Rees, who gets personal. And in the musical pilgrimage … we hear from Southpaw and Joseph Duigan. National Motor Museum Director Paul Rees, shares his memories of the 1978 Mazda 121, which was his first car upon arriving in Australia in the early 1980s. Steve drove in the Bay To Birdwood in a Mazda 121 with David from Paradise Motors Mazda, and Japanese journalist and blogger, Asami Sakura. Glen Dix set the day off. What is special about the 121? How did it compare, back in the day? Did Japanese cars cope with Australia’s summer? In Australia, we have a lot of people who love restoring old cars and celebrating memories of driving in them – is that something Japanese people share? Are people tribal with their brand loyalty? Is there a culture of going for Sunday afternoon drives? Is there a culture of popping to the shops in the car? With the doors closing at the Elizabeth Holden Assembly Plant, the National Motor Museum has today launched ‘[Re]assembled: Australia’s automotive manufacturing journey’. It’s a new permanent exhibition to preserve the Holden workers’ legacy and the story of the assembly plant that has sustained thousands of South Australian families. Why do we need this exhibition? What are the symbolic pieces you have chosen to tell the story? Presentations were made to 15 General Motors Holdens employees who celebrated 25 years of service with the company at a special dinner at Government house last night. A silver tray was presented by his Excellency Sir Robert George to Mr. B. Peddington who has been with the company for 50 years. He started work with the SA firm of Holden & Frost saddlery makers, which developed into the present company. Australia will be represented in the Monte Carlo car rally this year for the first time in the rally’s history. An Australian-made car, the Holden, has been entered, the Royal Automobile Club announced last night. The rally, the twenty third to be held, will start for British cars on January 20 from Glasgow. Altogether 440 cars have been entered from eight nations an all-time record. There are 114 British entries. AAP. Thousands of people today visited the showrooms of City Motors Pty., Ltd., and State Motors, Ltd., to see the Holden utility on display for the first time. Each of these firms had one of the new utilities on display. The public, not previously informed on details of Holden’s latest product, showed much interest. In 100 Weeks Ago, we revisit our evening spent with publicist, Neil Ward. One of the topics that arose was how people are getting worse and worse at RSVPing when invited to events, even with free tickets to media previews. So we spent a few minutes with Michelle Toft, a project curator from the National Motor Museum who was moonlighting as the PR person for the Bay To Birdwood to find out what media types have been like for her. PS She has an intriging exhibition opening later this year about Australia’s first female garage owner, Alice Anderson. And our song this week is 5 Days by Southpaw and Joseph Duigan, selected by our musical curator, Todd Fischer. This week’s featured track comes from an Adelaide producer & vocalist named Southpaw and features another local, rapper Joseph Duigan. They released an EP together at the end of July called Questioning Why which combines seductive J-Dilla style beats with Duigan’s wide array of rapping styles. She also hosts an awesome radio segment called Carousel each Sunday between 8 and 10 pm on Fresh FM which features a wide selection of rare soul, hip-hop and jazz records. You may also know Joseph Duigan from his other project Argus and the Liar, if not then I definitely recommend checking them out. The track I’m going to play this week is called 5 days which shows off Southpaw’s beautiful, dreamy vocals, and Duigan’s smooth rapping sounds similar to US rapper Brother Ali. Make sure you check out the rest of the EP Questioning Why but once again this is 5 Days by Southpaw and Joseph Duigan.